This is a view from Tafika Camp in northern South Luangwa, looking west across the Luangwa River. See a picture caption by placing the cursor over the picture. If you find that I've spelled any names incorrectly, or mixed things up, please send me a note. Thanks. The itinerary for this trip was arranged through The Africa Adventure Company. This is the journal record (slightly edited) of a trip my brother Jim ("Jungle Jim" . . . or JJ) and I took to Zambia and South Africa from August 3rd through the 22nd, 2004. We flew from West Palm Beach to Atlanta to Johannesburg; then to Lusaka (Zambia) and on to Mfuwe and to the Chichele Lodge; then to northern South Luangwa and Tafika Camp; then back to Johannesburg; then to the Kruger National Park area and Kirkman's Kamp; then to the Djuma Game Reserve and Vuyatela Lodge; then back to Johannesburg and (by car) to the Palace Hotel at Sun City; then back to Johannesburg for the long flight home. The cabin lights illuminate and I try, without much success, to get comfortable in seat 54A. The pilot announces it's 8:15 a.m. and we're about two hours from Johannesburg. Our flight from Atlanta will last some 18 hours, including an hour stop-over for fuel at Cape Verde. The Airbus A340-600 is an impressive plane, but the spacing between seats leaves a lot to be desired. The temperature control has been good, the individual flat-panel video screen 20 inches away from my nose is quite nice (though the viewing angle is terrible when the guy in front of me leans his seat back), but my biggest complaint so far is last night's "snack." They quickly ran out of turkey sandwiches and the alternative was a cucumber sandwich! I finished half of mine; Jungle Jim returned his untouched. It was pretty bad. This culinary snafu was particularly disappointing, as yesterday's lunch was quite good (for in-flight food, that is). Once again I'm yielding to the call of Africa: the scenery, the animals, the adventure. This time we're going to Zambia (I've never been there before) and the Republic of South Africa, and it's the middle of the winter (in the southern hemisphere). I'm assured animal concentrations will be greater and the viewing will be more rewarding. We'll see. I have my new laptop computer with me and it should make taking notes considerably easier. Also, when I take still photographs with my video camera, I'll be able to download them to computer storage. With luck, I'll also be able to send some e-mails along the way instead of postcards which often arrive back in the U.S. after I do. There's a wait in the customs line in Johannesburg, but in short order we have our passports stamped, find our luggage, and meet Derrick (from Wilderness Safari), our contact and driver. He's a nice, friendly fellow and drives us to our hotel, The Grace (at Rosebank), by way of his home, where he collects our papers and vouchers. Literature in our room at the Grace says readers of Conde Nast rank Grace the third best hotel in Africa! It is nice! The room is spacious, the shower stall has a window overlooking the surrounding community, there are a couple of Internet-access rooms (available at no charge! ), and we can see the pool (strangely, it's maybe seven feet wide and 75 feet long!) from our sixth-floor room window. The weather is absolutely delightful -- warm and bright, but we're told night temperatures are likely to dip into the 40s. At the front desk I inquire about a side trip for tomorrow. My first choice, the cheetah center, is closed Fridays, but I'm told about Lion Park, and I sign us up for a 9 o‘clock departure. We stroll through the next-door mall, accessible from the second floor of the hotel, and it's surprisingly comparable to U.S. malls: a furniture store, electronics store, clothing stores, drug store, health-food store, etc., but in addition it has a large and interesting series of African craft booths. I fall in love with a giant giraffe carving -- it's seven feet high! -- but realize I could never conveniently get it back home. A slight headache has me puzzled. Is it from the time zone change, the excitement and anticipation, or could it be the early-warning sign of a cold? I take a Tylenol. We find weariness beginning to overtake us, so we head back to the hotel for a nap. Ah, sleep! Afterward, we check out the Internet rooms. We both log on at separate computers, send e-mails, and retrieve the latest stories on Drudge, NewsMax, and WorldNetDaily. I then use my laptop to make some log entries and I turn in at 11:00. Jim is already sawing wood. My internal clock makes our 7 a.m. wake-up call unnecessary. I look at my watch. The face is blank; the battery is dead. I check my alarm clock. It's 5 o‘clock. JJ sleeps until 6:00. The sun rises about 15 minutes later. After a hearty breakfast (scrambled eggs with salmon for JJ; omelet for me), we find our driver, Duncan, is already waiting to take us to Lion Park. He's 45 minutes early! The weather is again outstanding and we get some good close-up views and photographs of the wild ones. We then enter a walk-around area where more animals are kept in smaller enclosed spaces: wart hogs, a jackal, a black leopard, tigers, cheetah, others. 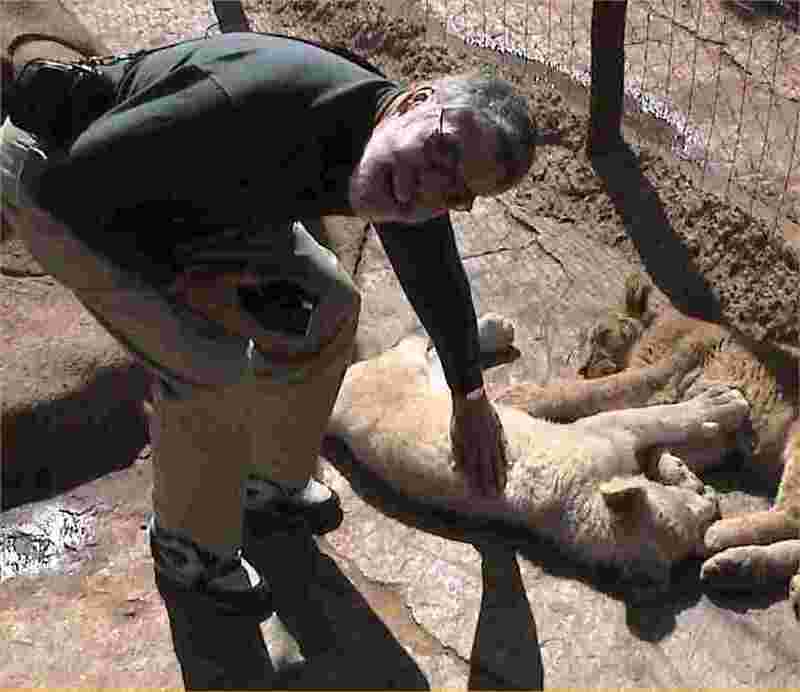 The highlight is an enclosure containing a half-dozen or so lion cubs. With a park official we enter inside and are allowed to pet the cats. Some are six months old and have sharp teeth and claws. At this age they begin to get dangerous, we're told, and next week they'll be moved to one of the drive-through areas. We're back at the hotel at half-past noon and proceed to the dining room for lunch. Then, after a spell in some easy chairs in the lobby lounge (while our beds are being made up), drowsiness overtakes us. Nap time. Jim resists. For about 30 seconds. For dinner we decide to forego an entree and just have an appetizer. Our waiter is puzzled. "No entree?" he inquires, after we make it clear that's what we want. "No entree?" he says again. Then for dessert I ask for a single scoop of ice cream. The waiter is again caught off guard. "One scoop?" he asks. Yes, just one scoop. "Just one scoop?" he says with seeming astonishment. After our entree-less supper we spend some more time on the Internet, then turn in about 11 o'clock. I'm guessing it's about 4 a.m. when I wake up. I can't get back to sleep, so I just enjoy the darkness and anticipation of what's ahead. Our wake-up call comes at 6:30. Shortly thereafter I'm in the shower looking out the large window that faces east. The horizon is aglow in shades of red and orange. Moments later I notice the tip of the sun is just visible. It's a grand sight. When I finish my shower the sun has broken the horizon. What a great way to start a day! After breakfast we pack and prepare for our 9 o'clock pickup. It's going to be another full day of travel. Derrick arrives at the hotel to drive us to the airport. Along the way I remark that traffic is a lot lighter than what we encountered Thursday. Derrick says it's because it's the weekend, and a three-day weekend at that. "What's the holiday," I inquire. "It's National Women's Day on Monday," he replies, with a somewhat sarcastic tone in his voice. Without blinking an eye he answers: "Every other day of the year!" At the airport we zip through customs, with Derrick's help. We then spend some time looking through the duty-free shops, then board a bus to get to our plane. Our flight departs 20 minutes or so late from Johannesburg, but arrives only five minutes tardy in Lusaka, Zambia. Zufu, our contact man there, meets us and shepherds us through customs. A letter we're carrying from The Africa Adventure Company is supposed to obviate the $30 per-person visa charge, but there's a hitch. The customs agent claims the exemption only applies to tours arranged by travel companies operating in Zambia. We're shuffled to another agent, who shuffles us to a third, who suggests Zufu find the Africa Adventure Company listing in a stack of what looks like 250 pages. Zufu starts through and seems to find what he's looking for on the fourth or fifth page. We return to the first agent, but he waves us to Agent 2, who looks very questioningly at the page. Nevertheless, eventually, we're granted the exemption. We pass through the Zambia domestic-flights metal-detection machine. Bells ring, but no one seems concerned. It's as if the device is simply window dressing. We load into a 19-seat Beechcraft plane. Every seat is taken. Jim and I share the bench at the rear that seems wide enough for two people, but must accommodate three. And the third is a heavyweight. We can't all lean back at the same time; there isn't room. Arriving at the Mfuwe Airport we're met by Botha, our driver and guide, who loads our luggage and us in a Toyota Land Cruiser. Coming along with us are the plane's captain, co-pilot, and stewardess. They'll be staying at the Chichele Presidential Lodge, too. After about an hour of our hour and a half trip to the lodge, our vehicle is driven onto a pontoon boat of questionable integrity. Then we're loaded on, too. Two oarsmen appear and they slip wooden "paddle-like" boards over a steel cable that stretches across the Luangwa River (which is loaded with hippo and crocodile, I might add), and they proceed to "row" us across. It's a unique ferry system. 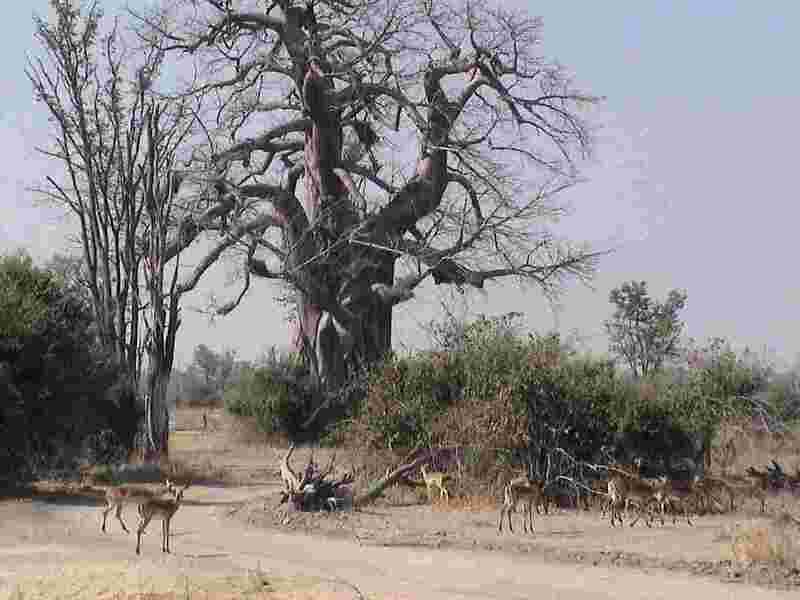 Crossing the river lands us in the South Luangwa National Park and animal sightings are more frequent and interesting. We see impala, baboons, elephants, and certainly the highlight: leopard! Botha tells us we're very lucky to see leopard. As we pull up to the entrance of the Chichele Presidential Lodge, there's a little welcoming party to greet us, including lodge director Nic and his wife, Tracy. We're each given a little glass of juice (don't know what it is, but it's delicious), and then we're led to our room -- Number 9 (the lodge has only nine or ten units). It's spacious and (this surprised me): air conditioned. After dark our night drive is very productive, with sightings of cape buffalo, hyena, impala, and . . . another leopard, this time a male! An occasional sneeze makes me think about the possibility of a cold. I can't have that. Not here in Africa! Dinner, though late (after 8 o'clock), is delicious. All the guests -- about 18 -- sit at a long table that overlooks the swimming pool. There are no doors or windows on two sides of the room. There are no bugs or other disturbances, but a couple of bats fly here and there occasionally. It's enchanting! We are advised to have a guide take us to our room (#9) after dark. I begin to wonder why, because he's unarmed and carries only a flashlight, so I ask him what he'd do if he saw a lion. I assume there's a certain procedure -- maybe a call for help, a fast retreat to a nearby porch or veranda, a blow on a whistle, something. He answers me, "I'd run!" During the night I awake to the deep gurgling sound of elephants. How exciting, I think, to have elephants so nearby. Then I realize the sound is coming from Jungle Jim! The time zone difference still has me out of sync. When I awake about 4:30, I figure I'm not likely to get back to sleep, though I try for a while. When I check my clock in the bathroom, it's two minutes to 5:00. I go back to bed and think about the mosquito I saw inside my mosquito netting when I went to bed. I had sprayed around some, but did I get him? Does he have malaria? I get up again and check the time. It's 5:44, nearly a quarter hour after our wake-up call was promised. JJ is still sleeping. Turns out, he tells me later, this is his best night sleep in recent months! I awaken him and we begin to get ready for our 6 a.m. drive. A knock on the door is the wake-up call -- a little after the fact. We swallow some juice and/or tea, we're off in the Land Cruiser. There are four other guests (besides ourselves) and the driver. The temperature is cool, but moving along in the open vehicle it's downright cold! Fortunately, we had been advised it might be, so we're glad to be wearing The Africa Adventure Company fleece pullovers. As time passes, we warm up, and after a couple of hours we shed our sweaters. The drive is quite successful with sightings of elephant, wart hog, giraffe, impala, hippo, crocodile, puku, buffalo, kudu, and more. I'm taking video and still pictures, so each animal encounter is a fun challenge. Around 10 a.m. we're back at the lodge. Just to be safe, I check my backpack. Something is wrong. The zippers aren't as I left them. The contents of my folder with my airline tickets, passport, and money have been rearranged. I take an inventory and everything seems to be there, but it looks like someone was poking around in my belongings. I find Nick and Tracy and tell them. Naturally, they're very concerned and very apologetic. My laptop computer and other belongings appear to be untouched. The incident takes us to 11 o'clock; lunchtime. Actually, it's breakfast. Jim has scrambled eggs, I have a cheese omelet. There's also bacon, sausage, tomatoes, chicken enchiladas, beans, and several salads -- quite a selection of choices. There's a break in the day's activities, so I get a chance to catch up with my journal. I also get a chance to catch up with sleep. I take an hour and a half nap. JJ fills his time watching the animals from our room's balcony and reading background information about the lodge and the South Luangwa National Park. Soft drinks and snacks are served at 4:00, then it's time for another game drive, which culminates in a spectacular leopard sighting after dark. 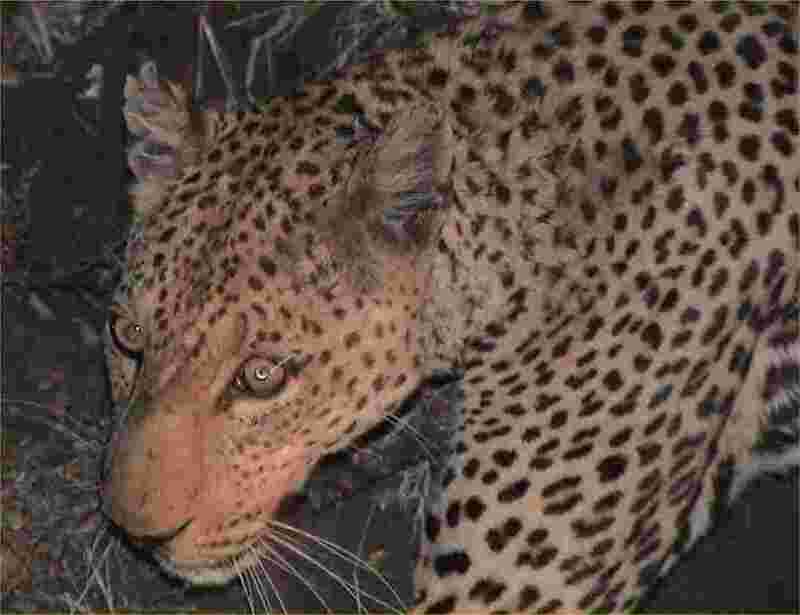 Our driver had searched unsuccessfully during the daylight hours for lion and wild dogs, but then in the early evening heard from other drivers a leopard had been spotted. He drives about while the spotter sweeps his searchlight back and forth across the darkness. Several other vehicles from other camps join in the search. A half-dozen shafts of light crisscross each other as the Land Cruiser turn this way and that and churn up clouds of dust. It looks like there's an escape from a penitentiary! Finally, our driver second guesses the movements of the leopard and drives our vehicle along the edge of the dry riverbed. There, some distance from the initial sighting, the animal emerges from the bush and crosses the road directly in front of us. We make a right-hand turn off the road and follow the leopard, driving right next to the cat and accompanying it for five or ten minutes. Cameras are clicking and everyone (there are four other guests in the vehicle besides ourselves) is giddy with delight. The encounter delays significantly our return to the lodge. We're an hour behind schedule when we finally reach the entrance. Nic says he was about ready to put together a search party to find us. Fifteen minutes later we gather for dinner. It's a barbecue: beef, chicken, lamb, sausage. The dessert is unusually good; some kind of crumb cake. Delicious! About then the conversation turns to politics. On my left is a lawyer from New York City who specializes in lead-poisoning cases. From his comments I conclude he's making tons of money suing "nasty" land lords who don't follow the letter of the law with regard to lead paint that was applied 20, 30, or 40 years ago to New York apartments. When he starts bashing President Bush, I feel my temperature rise. I call him on one of his wild assumptions: 100,000 minorities were denied the right to vote in Florida in the 2000 elections. He says, "Of course it's true." I suggest I might have a better view of what happened because I live in Florida. He says, no, he has a better view living in New York City. The conversation then turns to the movie "Farenheit 9/11". I mention that even the New York Times conceded the movie is factually in error. Oh, no it's not, he contends. Most of the others at the table are on his side. Heaven help the U.S.A. The "party' ends before the discussion becomes more heated, but as we say goodnight, I mention that we could settle the matter with a simple duel by the swimming pool. The lawyer is not amused. Nic gives us the option of sleeping in tomorrow morning and going directly to the airport, or getting up early and taking a game drive on the way to our flight. The choice is easy: the latter. Checking paperwork for tomorrow's flight, Tracy asks to see my tickets. I look through my folder. There are no tickets. Tracy says she'll call the terminal in the morning and check into the matter. I decide to charge up my laptop and camera batteries, but discover the adapter Nic gave me is the wrong one. It won't plug into any socket in the room and it won't accept U.S. plugs. Bother. Fortunately, I have enough batteries to last at least until we reach our next lodge. I awaken at 5, as does JJ. Jim decides to take a shower, but a gigantic insect of some sort dissuades him. He settles for a "sink bath" instead. We're nearly packed and ready when we get our wake-up knock on the door. After a "breakfast" of OJ and toast, we're on our way. Our driver is very good at spotting animals and telling us interesting tidbits of information. He tells us, for example, how to tell male from female impala droppings (the female's are clustered; the male's are more disbursed -- also, a female will urinate on her droppings, a male will urinate away from his droppings). Important stuff! We see a herd of 300 buffalo, countless impala and puku, baboons, hippo, crocodile, giraffe, hyena, elephant, and more. Our drive lasts three hours. It's great! At the airport I'm surprised when a man I don't know greets me by name. “Hello, Fred. Welcome.” Apparently our tickets are in order and were kept for us at the terminal. We meet our pilot (Mike), hop in a single-engine Cessna, and 15 minutes later land at a bumpy, dirt airstrip. There's no terminal, hardly any sign planes land there, except for a windsock hanging rather lifelessly by the side of the strip. A Land Rover is waiting. In it are a driver (didn't catch his name) and Allison, who works on reservations at the lodge, and took pictures of our landing. The Tafika Camp consists of five hut-like structures covered with straw, or what looks like straw. Each is quite spacious (maybe 14 by 26 feet) and has an attached (roofless) sink area and shower. A little room for the toilet has a cone shaped roof. At night, one dim light illuminates the toilet (leaving the sink and shower unlit); another illuminates the room. After lunch I begin to make entries in my journal, but my laptop notifies me only 10 percent of my battery power remains. The lodge director, John, tells me the electrical plug on my re-charger unit doesn't fit available adapters, so I begin to hand-write entries in a notebook I brought along. One of my video camera batteries also needs charging, as does my electric shaver! At 4 o'clock we start out on our afternoon/evening drive. A dramatic encounter with three elephants provides great photo opportunities. We also see buffalo, giraffe, a bunch of other animals, and in the evening, once again: leopard! On the drive back to the lodge we see civet, porcupine, a little shrew-like animal, and several other interesting sightings. We're quite late getting back to the lodge. Dinner is served after 8:30. Worries of the possibility of an approaching cold convince me I should dig into the stash of Ester-C I brought along. Back in our "hut," mosquito netting has been draped around the beds. I examine our accommodations and remark: "Either we've been given an after-dinner mint, or there's a beetle on my pillow." I whisk the beetle away. As expected, our wake-up call is at 5:45. A half-hour later we find a light breakfast has been set up in an area under the trees and overlooking the Luangwa River. But I'm not hungry. This morning I'm excited because I'm going on an ultra-light ride. (Some at the camp call it a "micro-light".) It commences about 6:30. The ride is amazing! Not at all bumpy, as I thought it would be, and it's not as cold as I expected. Actually, it's warmer up in the air than on the ground. I struggle with my video camera to capture images from the ride. The face shield of my helmet makes looking into the viewfinder a little difficult. I hope at least some of the pictures turn out! The ride lasts only 15 minutes. We (pilot John and I) circle around, sometimes only six feet off the ground. We see perhaps a thousand buffalo grazing lazily below us. We see some elephants. We see puku and wart hogs. We see an eagle's nest with a baby eagle inside. Then we fly along the river. Then directly in front of the lodge. All too quickly John lands the tiny craft on the airstrip from whence we departed. It was a great thrill! Almost immediately, it's time for our walk. Five guests (three others besides JJ and me) plus a guide (Ernst), plus a tracker (he's the one who carries the rifle), plus a porter start out. Almost immediately we come across three elephants. I begin videoing. They're not too far away. Ernst directs me to close up ranks. When I don't do so immediately, he explains I must react more quickly. I learn the lesson. When Ernst says jump, he means right now, not five or ten seconds from now. Now! The elephants come toward us and we're caught between them and the river. We move to the edge of the river bank, then climb down on a small ledge that's maybe 12 feet above the water. Ernst shouts to divert the elephants, but they keep coming. It looks like they're heading for the river and will take a route literally feet from where we're crouched. The terrain prevents us from moving from our position. Ernst's voice takes on a quality of concern. We wait. We can't see where the elephants are. Only the tracker is in a position to see. Finally, he signals the animals are taking another route to the water. Unfortunately, it's between us and the canoes we must use to cross the river. We wait. And we wait. And we wait some more. Perhaps 45 minutes pass before the elephants reach the water, drink a sufficiency, and move slowly across the river. We make our way to the canoes. But another challenge lies ahead. Two pods of hippo are lying in the water between us and the other side. We have to navigate between them. The trick is to keep outside of the territories of both pods. But it's not entirely clear where the territorial lines are! We start out. There are four people in each canoe, but only one has a paddle. We get to the middle of the river, past one hippo pod, but then become lodged on a sandbar. The paddlers take off their shoes and get in the water to free us from the sandbar. The hippo closest to us suddenly bolts to his feet, staring intently at us. Then he turns his body to face us directly. This is it. If he charges, there could be real trouble. He doesn't charge, but continues to stare rather menacingly at us. The canoes are dislodged, the paddlers get back in and we continue to the other side. 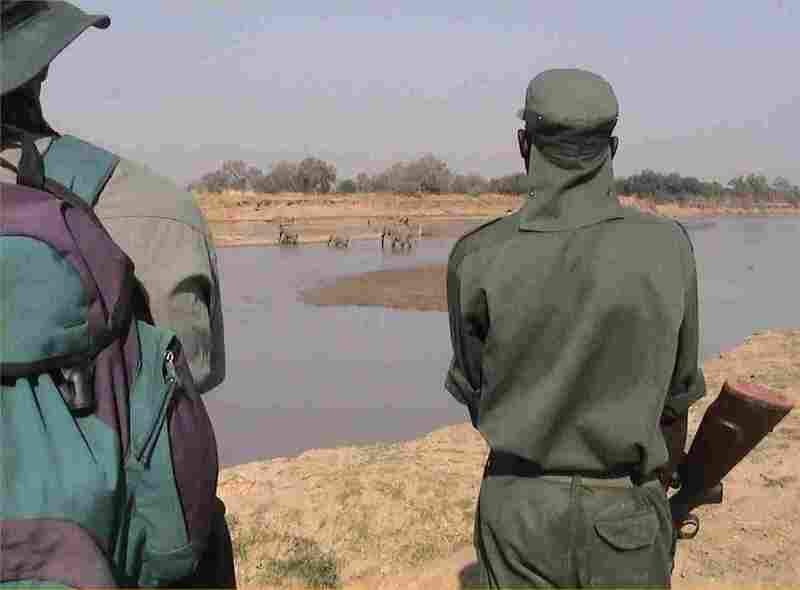 However, the elephants we dealt with earlier are now on the same side of the river and they remain a threat. But, they slowly move off into the grasses. We beach the canoes, sigh a collective sigh of relief, and begin our walk into grasses, too. The walk is grand: through tall stands of grass, along dry riverbeds, through the underbrush. We come upon a hippo soaking in a large pool. Seconds later it emerges at the same point from where we were observing it. Every now and then, Ernst quizzes our group about the names of birds. JJ and I fail every test, while the others in our party sometimes get the right answers. I can't even name birds Ernst identified an hour ago. It's clear, bird names are not my specialty. After some time, we stop for tea. The porter makes a fire "the old-fashioned way" (rubbing one stick on another) and heats water he carried with him for that purpose. We enjoy a pleasant respite before we head back. At the river, we don't have to deal with the elephants, but we do have to run the gauntlet between the hippos. The "other" canoe once again becomes lodged on the sandbar in the middle of the river. The tracker who paddles "our" canoe takes a course further upstream and we don't get stuck. However, we find ourselves closer to the pod of at least a dozen hippos (it could be two dozen, for all I know). A pair close to us gets up on their feet and in an instant the waters are churning and splashing about. I say to myself, “well, this is it”, but the two are chasing each other, not us! We make it to the other side without further incident. What an exciting adventure! We enjoy lunch, I retrieve my laptop PC, which had been charging all morning (the director's wife, Carol, found an adapter I was able to use in the "office"), and I begin to update my journal. (My video camera is now charging one of its batteries.) The bad news: I forgot to bring along the cord to recharge my shaver. I see a scruffy future. When I go to the sink to wash up, I notice an unusual-looking "leaf" on the floor. Further investigation reveals it's not a leaf at all, but instead: baboon poop! Dozens of baboons were scampering about the camp after lunch -- in the trees, on the ground, all around -- and one (more?) made a deposit in our bathroom. JJ noticed a baboon splattering had occurred, too. I'm late for 3:30 tea by the river as I must retrieve my camera and store the charger, but I'm on time for the 4:00 game drive, which lasts into the evening. We see a great variety of animals, including genet, civet, mongoose, bush baby, and others. And, oh yes, another leopard! This morning we depart on our drive about 7:15. It's very pleasant. The animals are in great abundance. One pastoral scene is particularly impressive. 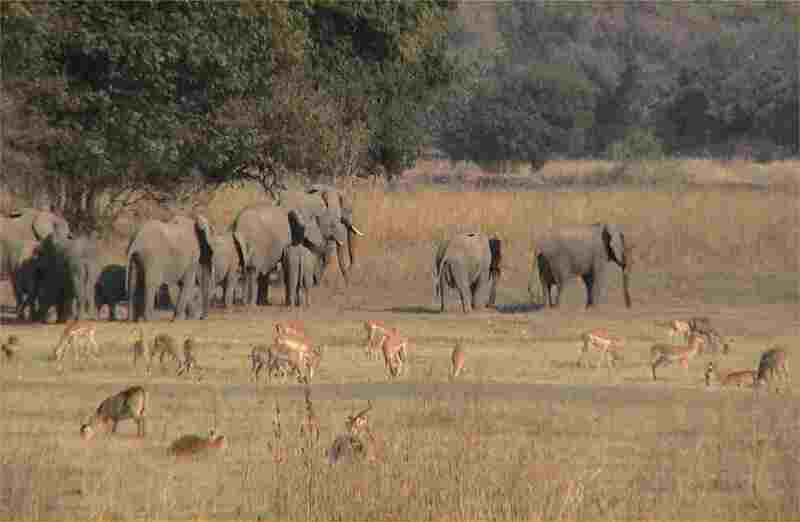 A herd of elephant grazes in front of a stand of trees, while puku and impala in great numbers graze nearby. We enjoy the sight from a rise that overlooks the flat open plain. We get some good photos of crocodiles and some more good shots of giraffes. It's a fine drive. After lunch and some "quiet time," we gather at 4:00 for our afternoon/evening drive. We're not more than a few minutes into it and we come upon a half-dozen elephants off on the right. They're not more than five or ten yards from our vehicle. They eye us carefully. I'm taking lots of video. The family moves forward through the bush and we parallel them on the road. At one point, the biggest of the pachyderms faces us head on, flares its ears, raises its trunk, and starts to lunge toward us. Our driver, John (the camp manager), merely guns the engine and the animal backs off. The elephants continue their slow march forward. Their trunks grab at grass and leaves along the way and they stuff their mouths. At the point where their path and our "road" cross, there's a confrontation. John positions our vehicle to cut them off. The elephants seem agitated. Again, one of them faces us head-on with ears flared. John drives ahead, letting the behemoths cross, and they do so with a cloud of dust. It's a thrilling incident and I get much of it on video tape. I think. I hope. The safari ride continues. This time JJ and I are with four other visitors who just arrived at camp. They're bird lovers. We're not. We stop at each sighting of something that can fly. Oh, is that a flat-chested scary warbler? Look, there's a nun's-feather calling crow? That one looks like a yellow-collared sand snipe. No, no, it's a gifted breasted ground scraper. With each sighting the check lists come out and another mark is made. Where are the purple melon-headed jays? They're listed on page two, column one. We stop for refreshment and enjoy a drink and some popcorn. (Yes, popcorn!) Then, as the skies darken and evening descends, we board again the Land Rover and head back on the road. The spotter sweeps his spot light from left to right and back again. There's not much to see. But then John slams on the breaks and shouts, "spitting cobra!" We leap to our feet and get a glimpse of the long black snake (five feel long, John says) only inches from the left rear wheel of our vehicle. Then, John accelerates abruptly and we're thrown back in our seats. "Why did you pull ahead," I ask. "The snake turned and was coming at us," he replies. He says further the serpent was so close, it might have decided to slither into the undercarriage of our Toyota. We didn't want that! The sighting is over in an instant. It was so fast, in fact, JJ missed it. Sitting on the right side of the vehicle, he couldn't see over the side to where the snake was. I got just a fleeting glimpse. The cobra's hood was not up, so it was not in a striking (spitting) position. It all happens too quickly to get any pictures. Our drive continues, but there are no other encounters as exciting. We see a porcupine, even a chameleon, but no other "new" animals. 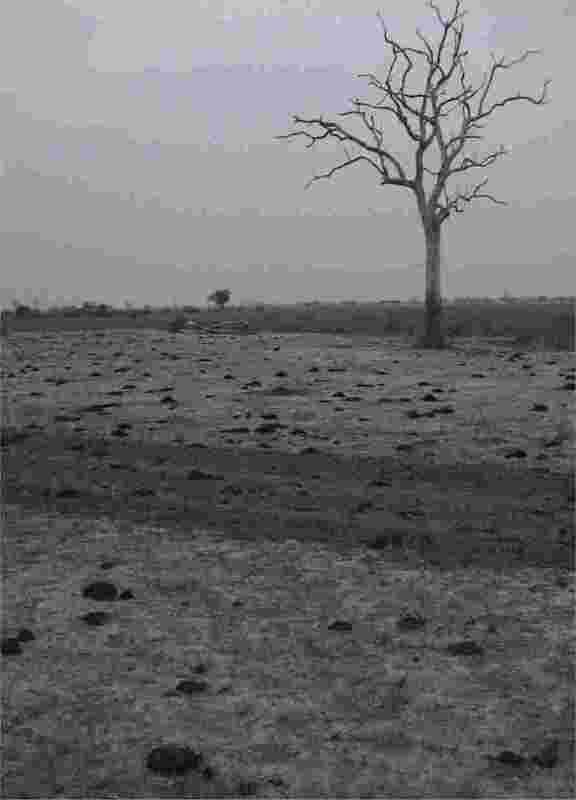 Of course we see numerous puku, impala, hippo, and the usual cast of characters. We're back at camp with 15 minutes before dinner. The meal is delicious! I decide another Ester-C is advisable. The wake-up call comes at 5:45. I take a shower. It's heavenly under the open sky. Then I take my camera to get some photos of Nicola's ultra-light flight. I snap three shots. JJ and I have been on several game drives with Nicola and her husband, David. They're a treat to be with. We enjoy a leisurely breakfast, then at 9 o'clock load into the Land Rover for the drive to the airstrip. It's somewhat cloudy and slightly cool, but a nice day, otherwise. We drive the length of the field where our plane will land to check for animals that might be in the plane's path. A number of baboons scamper out of the way when we drive along, but return almost immediately after we pass. Allison, who also accompanies us, explains that they're quick-moving enough to get out of the way of landing aircraft. At about 9:30 Mike and his single-engine Cessna set down. 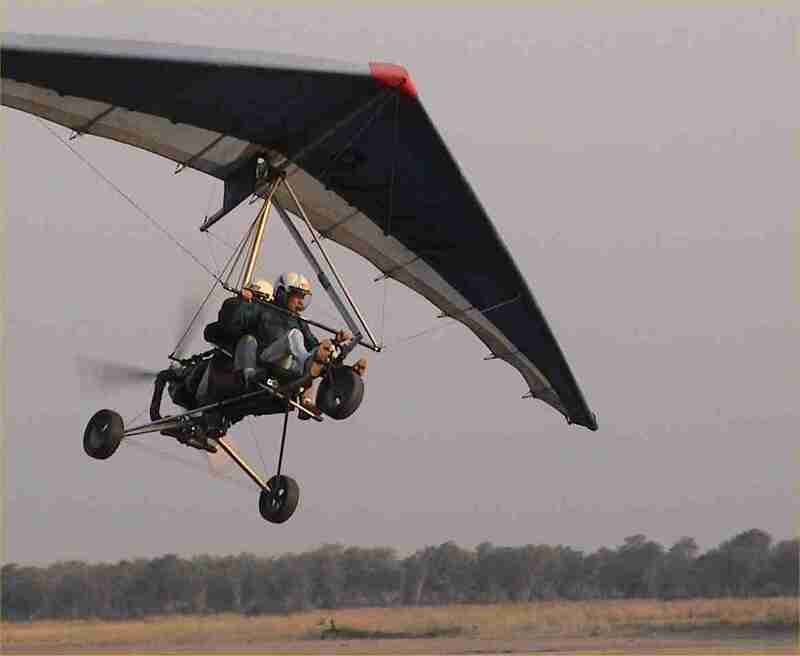 Two other guests get in with us for the 20-minute flight to Mfuwe. We get our carry-on items through the scanner at the Mfuwe terminal, walk through the metal-detector (it buzzed when I went through, but no one "wanded" me, because the attendant was too busy "wanding" JJ), pay the $5 per-person airport fee, make a stop at the men's room (dozens of packaged condoms lie on top of the urinal, available for the taking), and get our tickets and boarding passes (once again our tickets were held for us at the terminal). We have just a two-minute wait before we board the plane for the one-and-a-quarter hour flight to Lusaka. Departure is 15 minutes early! The flight is smooth and uneventful. Zufu finds us once we're in the Lusaka terminal, and he directs us to pay the $20 per-person airport fee. Then, after a series of waits, we board our flight to Johannesburg. After a considerable wait to get through customs, we collect our bags and walk across the street to the Airport Sun Inter-Continental Hotel. We don't like what's on the menu at the hotel restaurant, so we walk back to the terminal building and have a small pizza in one of the eateries in the food court. I try to get on the Internet, but there's only one terminal, and it's in use. (Besides, it costs $10 per half hour!) Thus, it's bed time. I'm now convinced I must mount a serious Ester-C attack, as cold symptoms are clearly at hand. We get a good, long night's sleep; we take delightful showers; we have delicious breakfasts at the hotel; and we're in the domestic flights terminal building shortly after 10 a.m. Our Jetstream 41 flight to Mala Mala departs pretty much on time at 11:20, and we arrive at the airstrip about an hour later. Our driver is there waiting to take us to Kirkman's Kamp (part of the Exeter Private Game Reserve), and when we arrive we're amazed at what we find. The place is beautiful! It's luxurious! It's wonderful! The rooms are carpeted, the shower floors and walls are tiled, and there's air conditioning. The lodge is too good to be true: lounge area, bar area, reading room (with a TV set for watching animal videos), indoor and outdoor dining facilities, an attractive gift shop -- and everything is exquisitely decorated with African artwork, photographs, and animal head trophies (impala, buffalo . . . even lion). This place is incredible, except the Internet-access computer terminal isn't working. After a delicious lunch we have an hour or so to look around some more before our game drive. You should see the swimming pool. It's gorgeous. And some of the flowering bushes are stunning. Highlights of our drive include an exciting and very close encounter with some buffalo and an intimate meeting with three rhinoceros. We get lots of great photos. The sunset was the best yet. Before dinner we have drinks and a selection of snacks. Dinner (appetizer: onion or vegetable soup; entree: filet of ostrich; dessert: ice cream with chocolate or caramel sauce) is outstanding. We stay to hear Niall, our guide and general host extraordinaire, tell stories about incidents where animals have killed people. What a day! Niall asks if JJ and I would like separate rooms, since both Units #1 and #2 are available. As I'm now sniffling and sputtering somewhat, we decide that's a good idea. It's a wonderful idea! A telephone in the room rings with a 6:30 wake-up call. I shower and get dressed, but I'm 15 minutes late for 7 a.m. breakfast. It's probably 8 o'clock before we're in the Land Rover with Niall and spotter Ralph. (Niall wears a headphone to keep abreast with reports of animal sightings.) In a short time they spot fresh lion tracks and we follow them. We go around a bend in the road, and there they are: three lions. The tail of one seems to be in the road, so we stop abruptly. The beasts move calmly off into the bush. We follow. After just seconds, they stop and look at us. 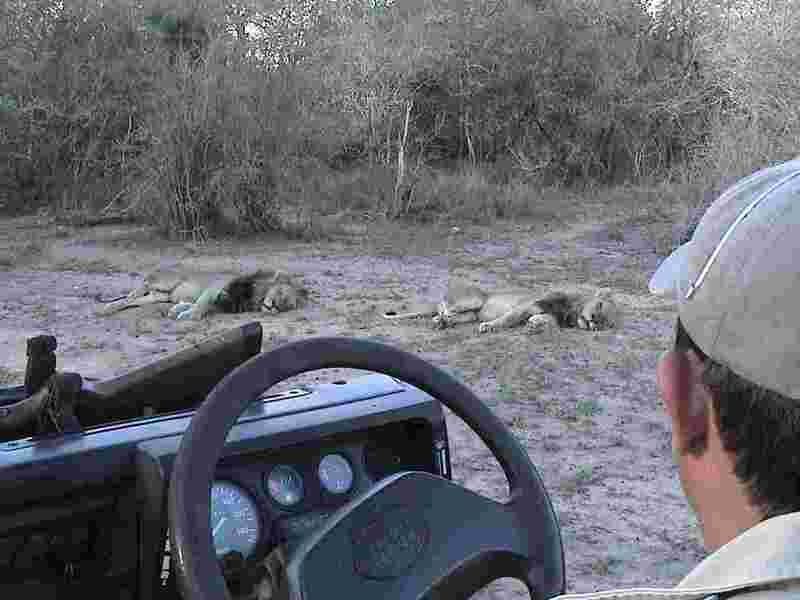 Niall drives the vehicle quite close, but the lions stay put. One is behind some bushes, one is on our left, the other on our right. We look at each other for a few minutes, then the lion on the left lies down, sprawls out, and seems to completely ignore us. The one on the right keeps us in view. We watch and take pictures for maybe 15 minutes. It's a wonderful lion encounter. Niall says the three will probably spend most of the day resting there. We may go back in the afternoon to see if they're where we left them. 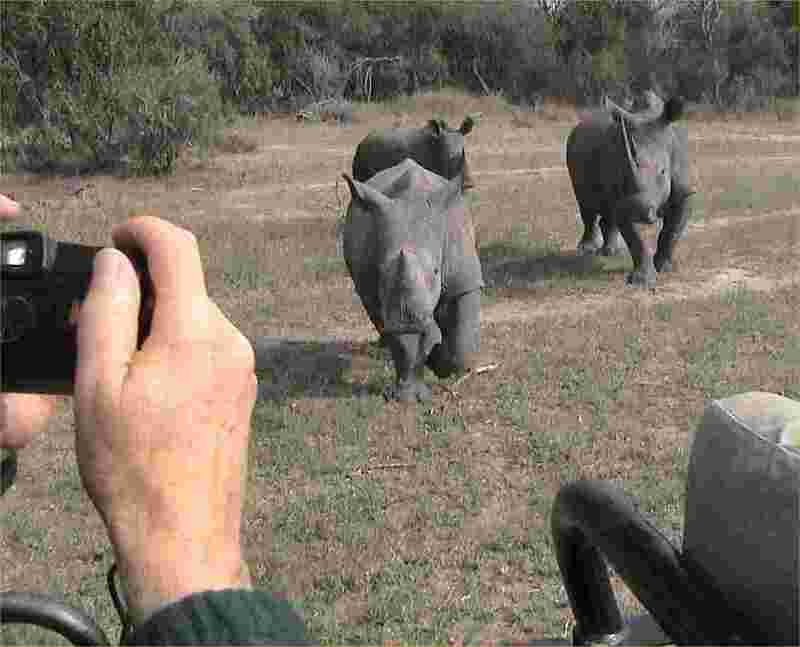 We then have a great rhino encounter and are able to get good, close-up photos. And then, toward the end of our drive, we come across five buffalo. The morning drive is a complete success. After a delicious lunch (ground beef casserole over rice, salads, bread, cheeses, and custard pie for dessert) I take an hour-long nap. Our afternoon/evening game drive starts shortly after 3 o'clock. We revisit the three lions and they are sprawled out in a small grassy area. They pay us little heed as we take more photographs. It's exciting to be in their presence. Then we drive around looking, unsuccessfully, for leopard and other big game. After our "sundowner" (drinks and a snack at dusk), we return to the lions when it's pitch dark and they are still lying around. After some time, however, they get up and almost in unison begin to roar. The sounds shake their entire bodies and it's awesome to watch and hear: their sounds are deep, guttural roars. They seem to roar in response to each other. 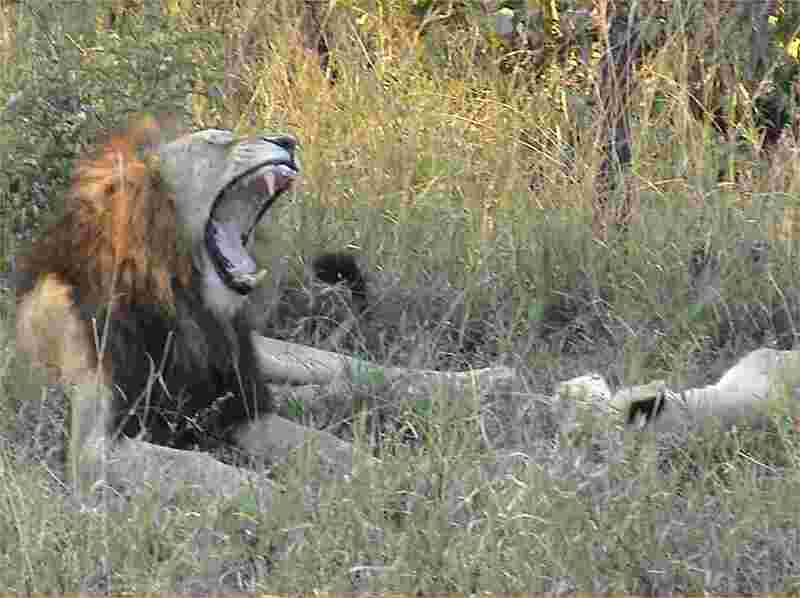 Niall says the lions are calling out to identify their territory, and also to invite females to come for a visit. I catch their roaring on video tape. Amidst all the driving about and animal sightings, the words to a song keep popping into my head: "I'm a beautiful red, red drum, and I train with the soldier boys . . ." What's all that about? The dinner is served in the "boma" (it's a Swahili word for "gathering place"). The appetizer is baked trout with a cheese topping. Entrees are pork and eland. Various vegetables and salads are offered, and dessert is once again ice cream. JJ chooses chocolate topping; I choose caramel. And afterward we're entertained by the kitchen staff marching around the boma singing several gospel songs. I'm now into heavy combat with my cold. But I know Ester-C will win the day. The wake-up call is at 6:30, breakfast at 7:00, and we're on the road about 7:30. There are no other guests with us; aboard are just Niall, Ralph, JJ, and myself. Our first encounter is a pair of elephants. We don't spend much time with them as Niall is bound and determined to find leopard for us. We drive all around, with frequent stops for Niall and Ralph to get out and check the ground for footprints. They determine leopards are heading in one direction, so we start off in that direction. Then, fresher prints indicate a male and female are heading in another direction. We follow them. When the tracks lead off the road, we plunge into the underbrush, knocking over bushes and small trees. We bump over logs and into holes. We dodge prickly branches as they sweep past our vehicle. We drive through tall grass -- maybe eight feet high -- along riverbeds that are nearly dried up. We search and search, but to no avail. The leopards -- male, female, and cubs -- elude us. After a break and another delicious lunch, we start off again before 3:30. The objective is again leopard, but the results are the same: no sighting. As the sun sets, Niall gets a report of the location of buffalo and rhino, and we rush to the scene. The buffalo -- eight or ten -- are slopping around in a pool of mud. Some are digging their horns into the goo. Others are drinking. It's a great encounter. It only takes a few minutes to reach the rhino. We find a male, female, and infant, but even the infant is pretty big. The horn on the male is enormous. We get lots of good pictures. We drive some more, then stop for our sundowner just as the sun touches the horizon. The sunset colors aren't as bright and impressive as last night's, but it's still a pretty scene. We continue the night drive in search of leopard. No luck. Dinner is served shortly after 8 o'clock. Appetizer: mushroom filled with spinach, with a melted cheese topping. Entree: lamb and kudu with couscous and assorted vegetables. Dessert: ice cream with chocolate or caramel sauce. Just delicious! Several days of heavy Ester-C bombardment have pretty much beaten back my cold. This is probably the second fastest cold recovery I've ever had! Having separate rooms really helped a lot. Thanks, Niall, and thanks, Kirkman's! This morning we're scheduled to fly to our next camp, but before that there's time for a morning drive. The hunt for leopard begins once more. Niall and Ralph scan the animal tracks looking not only for signs of leopard, but recent signs of leopard. After maybe a half hour, Niall speeds up the Land Rover. A report on his headphone tells him where a lone male has been sighted and we race to the scene. We arrive as the animal is walking along the dirt road toward the river. We follow him and take snap shots and video. He's magnificent. 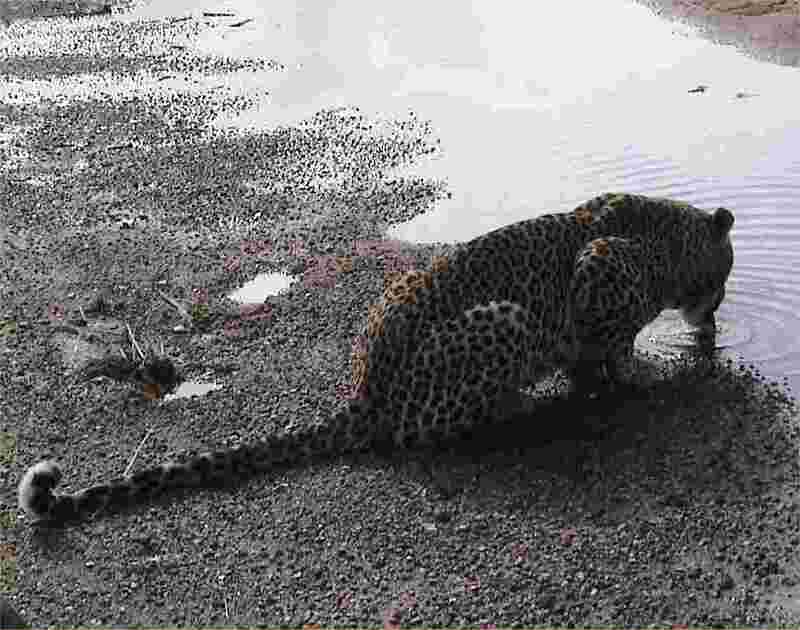 With what seems to be only mild irritation at our presence, the leopard stops at the river's edge and takes a long drink. It's a grand sight. After a good long drink, he rises and proceeds with a jump across the trickle of a river and into the tall grass and bush. We watch as he quickly vanishes into the reeds. Then, we follow him! Niall drives our vehicle directly into the heavy underbrush. We're bouncing. Branches swoop across us. Some have prickers. We knock over small clumps of foliage. We get stuck in a hole. We go back and forth until we're out. We plunge into the reeds anew. Pollen from the top of the perhaps eight-foot high grass rains down on us like rice at a wedding. Amazingly, we see the leopard once again, but just briefly, as he slowly makes his way off in another direction. What a thrilling encounter! Back at the lodge before 11, we pack and are ready to go by 11:45. The drive to the Skukuza "airport" (which is inside Kruger) is uneventful. This is more than just an airstrip, however. There's a terminal building. There's an arrival and departure section. And there's an airport fee (about $35 for the two of us). We're in the air in a Cessna for only ten minutes or so. 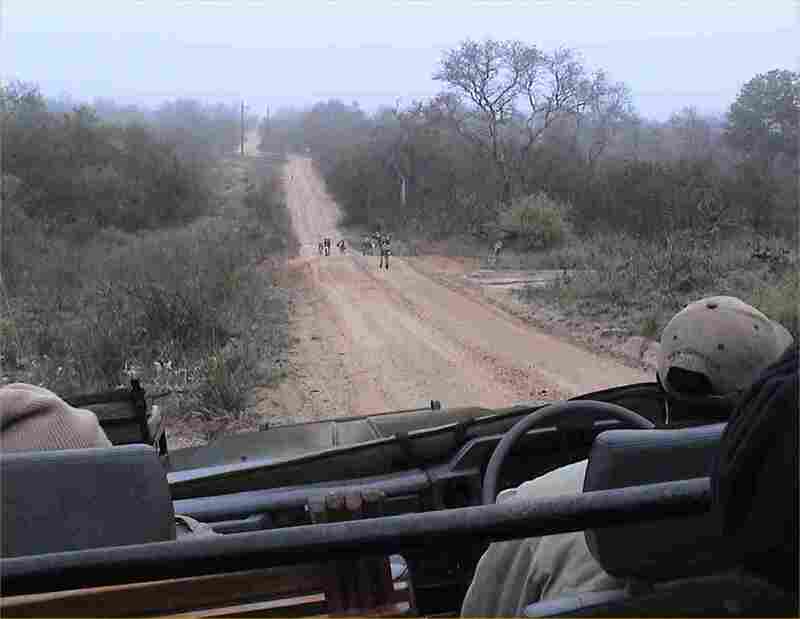 A direct drive wouldn't have taken very long, but a direct drive isn't possible because it would be through private game reserves, which is not allowed. Had we driven, it would have necessitated a round-about route that would have consumed three hours or more. We're met at the airstrip where we land by Rodney and a Land Cruiser and it's a ten or fifteen minute ride to Vuyatela Camp (part of the Djuma Game Reserve). A most interesting camp it is, with a mixture of pop, avant guarde, and African influences combined in its design. An observatory deck provides a great view over a little lake (man-made) and the surrounding savanna. A variety of animals is in sight: elephant, hippo, giraffe, water buck, nyala, impala, and others. The walls of the rooms (hut-like structures) are made with buffalo dung and cement. There's a small wading pool with a great view of nearby wildlife. The bathroom is enclosed, but the shower is outside, rimmed with sticks about six feet high. Bathroom sinks are tin buckets that have been set in a three-inch-thick concrete slab. There’s a separate sitting room with mini-bar and books to peruse. The two beds are enclosed in a single huge mosquito net. Both air conditioning and a radiator (for heat) are provided. And there are two computer terminals with access to the Internet! After lunch we head out on a drive and it isn't long before we hear (via a radio report) lions are in the area. We find them. It's a male and female. They're mating! It's fascinating to see. The pair seems relatively unconcerned they're being watched. Two other vehicles and ours vie for the best position to see the action. The engines roar as each Land Cruiser backs up, then pulls forward, then knocks through the bushes and small trees, but the lions have more important things to concern themselves with. The action is perhaps only seconds in duration, after which both animals sprawl out on the grass and rest. But about 15 minutes later, the female stretches, yawns, and gets to her feet. The male jumps up and follows as his mate walks off into the bush. They don't get very far, however, before passions again kick in and they're at it once again! This activity, we're told, continues day and night for two to three days. Darkness falls and we drive off to find a spot for our sundowner. Afterward, we continue looking for animals with the spotter‘s searchlight, but none of any significance is spotted. Whatever could have been found would have been an anti-climax anyway. A gentle voice outside our "hut" wakes us at 6:00 and we hurry to be ready for the 6:30 drive. The morning is overcast and cool. The sun tries to show itself, but never quite makes it. We see a good-sized herd of buffalo -- maybe 50 head. We see a couple of male elephants: an old-timer and a teen-ager. We drive some more before stopping for a drink of hot chocolate. Then a radio report comes through that both leopard and cheetah have been sighted. Our driver/guide, Solly, asks which we'd like to see. It's an easy choice: cheetah. In minutes, our spotter, Rodney sees him walking along through the underbrush maybe 30 yards from our vehicle. We head toward him. The cheetah finds a termite mound, climbs to the top, and searches for game in all directions. Then he jumps off and moves to another vantage point and continues his scans of the area. He then moves to a pile of rocks, sees some prey -- steenbok -- and leaps off in pursuit. The chase is at breakneck speed, first to our left, then around to our right, then back left, then back right again. Meanwhile, Solly has started the engine, and we start off to get a better view of the chase. We knock over some foliage, bump into a mound of dirt, and all of a sudden the Land Cruiser is out of commission: a bolt on the end of the steering tie rod broke. Solly radios for another vehicle to come rescue us. In 15 or 20 minutes it arrives; we get in and ride back to camp. What an exciting morning! Breakfast is served (delicious) and I take a very pleasurable shower. It's nice and warm; very refreshing. Lunch is at 1:30. There's too much food! JJ and I have some bread and salad; not much more. Afterward we sign on to the computers and it's only then we learn about Hurricane Charlie. I'm worried about my friends in Punta Gorda. I fear they sustained major damage. The weather remains gray and on the cool side, not the warm, sunny day I expect. The view from the lodge and our room is, unlike yesterday, without any sign of wildlife, except some monkeys occasionally jumping about above our heads in the trees around the lodge. The afternoon/evening game drive is relatively uneventful. We see another herd of buffalo lounging around a good-sized watering hole and we see a couple of elephants and a few other scattered animals. 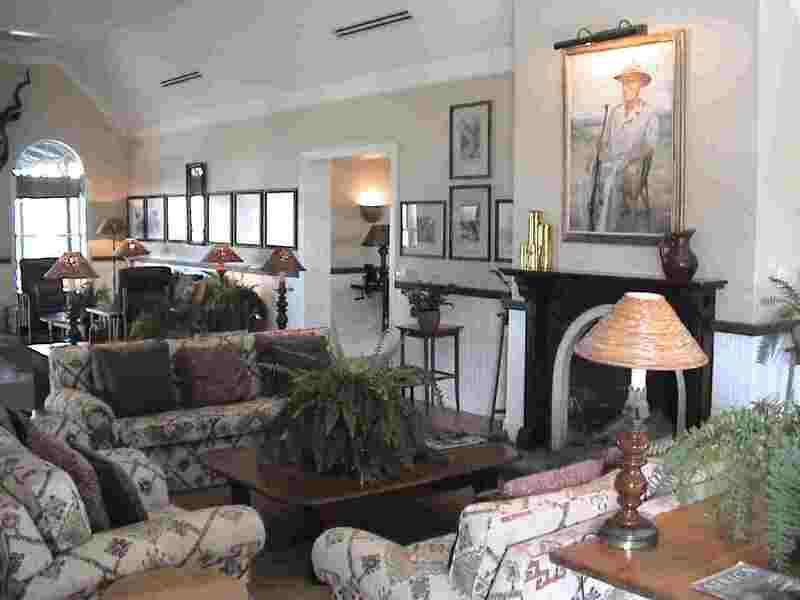 We request an early return to the lodge and arrive about 6 o'clock, allowing plenty of Internet time. Finally, I'm able to send off e-mails to family members and friends. Jim tells me he heard rain on the roof (which is nothing more than layers of straw) last night, and sure enough our wooden deck is wet, as is everything else. When we start our morning drive it's overcast and somewhat cold; not at all typical South Africa August weather. After a while a fine misty rain begins, and we zip up our fleece sweaters and wind breakers. The animals are apparently inactive during periods of rain, so there's little to see. 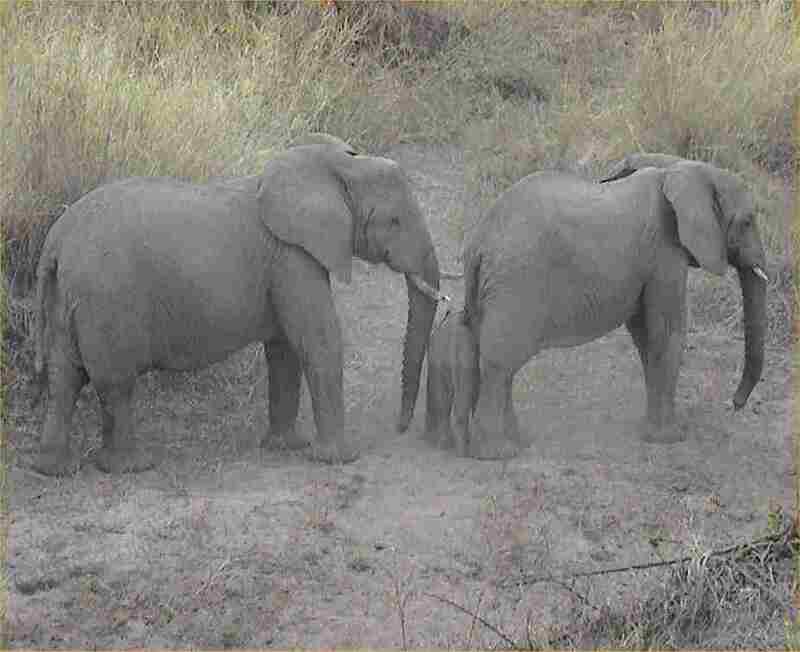 We see a deformed elephant (twisted tusk and bent left hind leg) and not much more. The misty rain stops for a while, but then a somewhat heavier rain begins. We bundle up in the blankets provided in the vehicles and try to protect our cameras from the moisture, but after a while it seems the effort isn't worth it, and I ask Solly to return to camp. We stand by the fire in the main room of the lodge to dry out and warm up. We can see no animals as we scan the scene in front of the lodge. Warm "hot" chocolate is served and it tastes good, but it's still a dreary day. A little before 9 the sun breaks through and warms our spirits, but the temperature is still chilly. Shortly after 9 we have breakfast (juice, bacon, eggs, corn fritters, etc.). The sun makes but a brief appearance, as clouds soon close in and obscure it. As is his custom, apparently, JJ flosses after breakfast, but this time the floss catches on the crown or cap on an upper, left tooth. He pulls, the cap detaches, and it shoots out, landing with a clank in one of the buckets that serve as wash basins in our bathroom. The good news: he's able to retrieve the cap and save it, so maybe it can be "reinstalled" when he gets back home. At 11 we head for the Land Cruiser and depart for a "village tour" (it‘s an extra-cost -- $35 per person -- optional activity). The village is where Solly and his family (wife and daughter) live. We visit several schools and I take lots of pictures, including video. 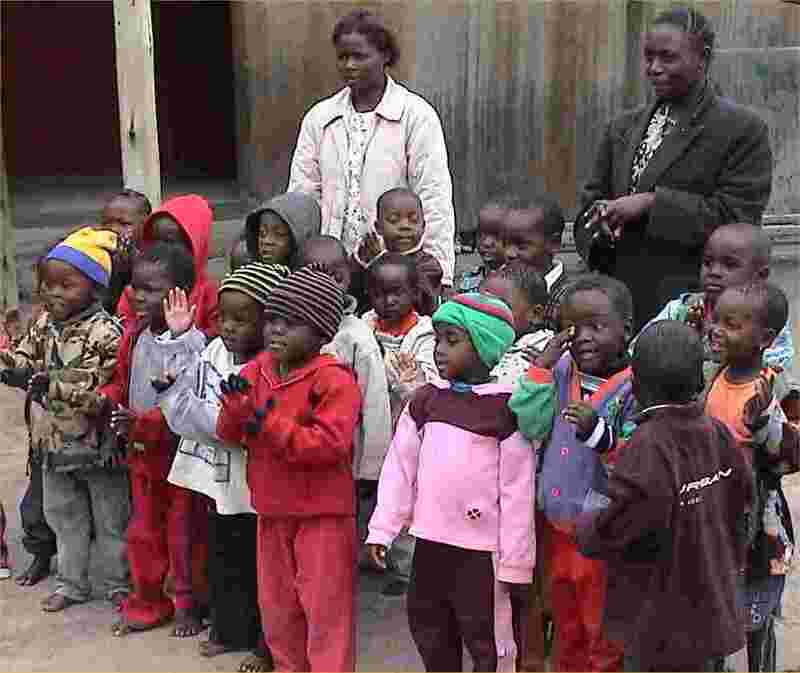 Each class stands up and greets us and most perform a song and/or a student gives a simple recitation. The classes display order, discipline, and courtesy, and might shame many a U.S. school. A light rain sends us back to our vehicle where we don waterproof ponchos, but the shower is a short one. We visit two villages and see where the people live and where they do their marketing. Occasionally we see a water faucet on a street corner. Dozens of large plastic bottles are clustered around, awaiting a fill-up. People are also clustered around the spigot; it seems to serve as a natural place to meet and converse. Our village tour takes about two hours, after which we're back at camp. It's lunch time. We spend more time at the computer terminals catching up with current events, and then are ready for our 4 o'clock game drive. Two elephants start off the action. One gives himself a mud bath, poops and urinates, and then moves directly toward us. It passes within a few feet of the rear of the Land Cruiser. What fun! 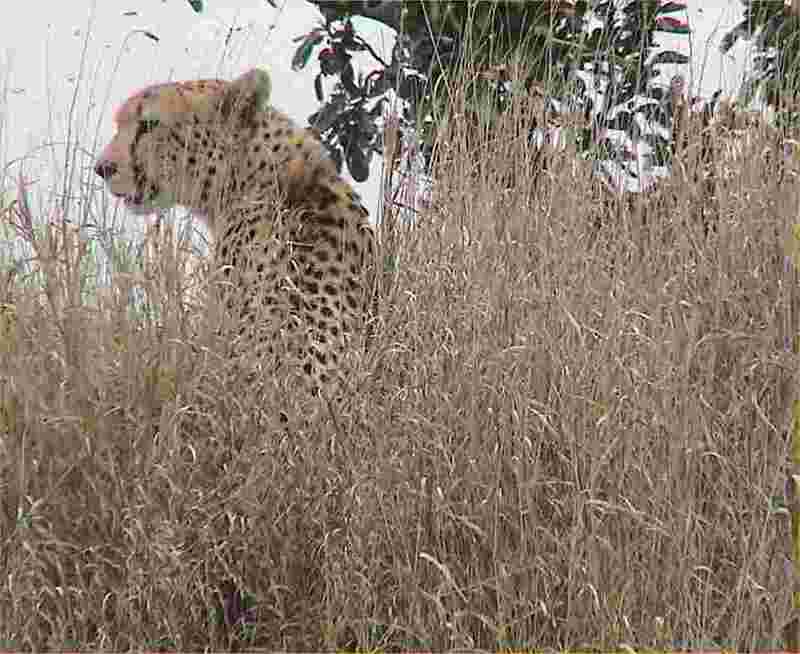 The radio beeps, chirps, and crackles and we hear a report a cheetah has been spotted. We head off to find it, but are diverted to pick up two new guests who just arrived at the camp. Will we miss the cheetah? We resume our pursuit, but then receive another report that wild dogs have been seen. The sun sets as we race off with another objective. Solly turns off the road and into the brush. The western sky begins to turn red as we come upon another vehicle. The occupants point to our right and there it is: another leopard, lying comfortably on the grass. Our approach seems to disturb the animal. She gets up and slowly wanders forward maybe ten yards. Solly drives the Land Cruiser around to her right side for a perfect view. But the light is fading. Nonetheless, we get lots of photographs. Some time later, after our sun-downer, we head back to the camp. Our spotter sweeps the strong beam of light back and forth in front of us. Suddenly, I see dots of light reflected in the beam. As we drive closer, we see the dots of light are the eyes of a pack of wild dogs! "You are very lucky," Solly remarks. Wild dog sightings are quite rare and here before us are 12, maybe 15 running along the road, frolicking, chasing each other, seemingly having a simply grand time. It's an exciting sight. There's not enough time for a shower, but I choose to take a real quick one anyway. I open the glass door to the outdoor shower stall and immediately notice 40 eyes looking at me. Some 20 baboons are staring down at me from a tree directly overhead, but they scamper to the next tree when I turn on the hot and cold water. The shower, albeit brief, is great. It's good to freshen up. A game drive commences shortly after 6:30. The day is again cool, and it's cold when the Land Cruiser is bouncing along the dirt road. A mist or fog hangs on the bush, but visibility is still a half mile or so. We encounter again the wild dogs, running along in the road ahead of us. Still frisky, they jump and play and dash around our vehicle. They're very entertaining. There's not much else to see. We're back at the camp at 8:30 for breakfast. We're to depart for the airstrip at 9:00, so we're in a hurry. My breakfast (an omelette) seems to take forever to cook and I gulp about half of it down, then head for the "cabin" to finish packing. I finish at 9 o'clock. But, then we're advised that our flight is delayed and our departure time is moved to 9:50. We have some time to catch our breath. A 15 to 20-minute drive takes us to the same airstrip at which we landed three days ago. A Cessna flies us to the Mpumalunga airport, but along the way we see buffalo and elephant and hippo. Usually, once you're in the air, the animals seem to disappear, but not on this flight. It's nice to see the the critters from above. At Mpumalunga we get our flight to Johannesburg and arrive there about 12:20 p.m. We look for the Wilderness Safari representative who should be there in the terminal to drive us to Sun City. He's not there. We wait five minutes, then ten minutes, then fifteen. He's still not there. I speak with the woman at the Information Desk. She suggests we wait some more, and we do. I speak with her again and show her our itinerary papers. She suggests we call the Wilderness Safari people, but there's a problem. I don't have any South African money and I can't get any unless I go to the International Terminal, and then I'll probably have to exchange at least $10 U.S. to get change for a 30-cent phone call. The information woman suggests we wait some more, until one o‘clock. Certainly someone from Wilderness Safari will be here soon. At one, I return to the information desk. Out of sympathy and pity she gives me a 2-rand coin -- her own money -- to make a call. I try one phone, but the number doesn't register. I try another. Same result. I return to the information desk and am advised I should try a third pay phone. I do. This time the number registers, but there's no answer. I let it ring for about a minute, then return to the information desk. The poor woman finds an emergency number for me to call. I go back to the pay phone. This time the number rings and a woman answers the phone! I identify myself and explain that someone should have met us when our plane arrived an hour ago. The representative tells me she'll look up my record. There's a pause, and a recorded message tells me I'm on hold and I should wait. I do. The message repeats. I wait. The message repeats again. I wait patiently. The message repeats once more, and this time I hear a click and a buzz, then the liquid-crystal display on the pay phone instructs me to hang up. The line has been disconnected. I revisit the information desk and explain what has happened. The representative is really sympathetic and uses what I suppose is her own cell phone to call Wilderness Safaris. To minimize the cost of the call, she instructs whoever answers to call her right back. We wait, but there is no call back. She then redials Wilderness Safaris and gives me the phone to sort out the problem. I'm told a representative, Gordon, will be at the terminal to pick us up in 20 minutes. Twenty minutes pass. No Gordon. Then twenty five. Then thirty. Finally, after thirty-five minutes, at two o'clock, Gordon races into the terminal, finds us immediately, and explains he had been instructed we weren't going to arrive for another hour or two. He apologizes profusely, grabs our bags, and rushes us to his car (van, really), which he had parked right outside the door. This was a little risky, since it's illegal to park there, but he tipped someone to look out for the vehicle while he was collecting us. Though the pick-up snafu is now resolved, I remain somewhat agitated because we lost over an hour and a half of our precious Africa time. That's an hour and a half less time at Sun City. 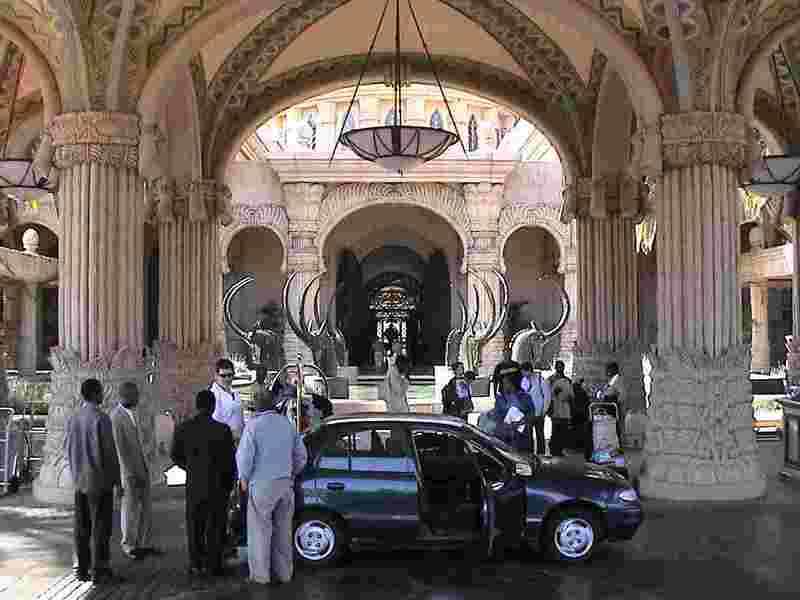 At four o'clock, following a two-hour drive at rather high speed, we check into the Sun City Palace Hotel. I'm delighted to be back. JJ is really impressed. I enjoy showing him some of the points of interest of the place. Confirmed for a balloon flight today with Airtrackers, we get a wake-up call at five o’clock, and we’re in the lobby a half hour later. 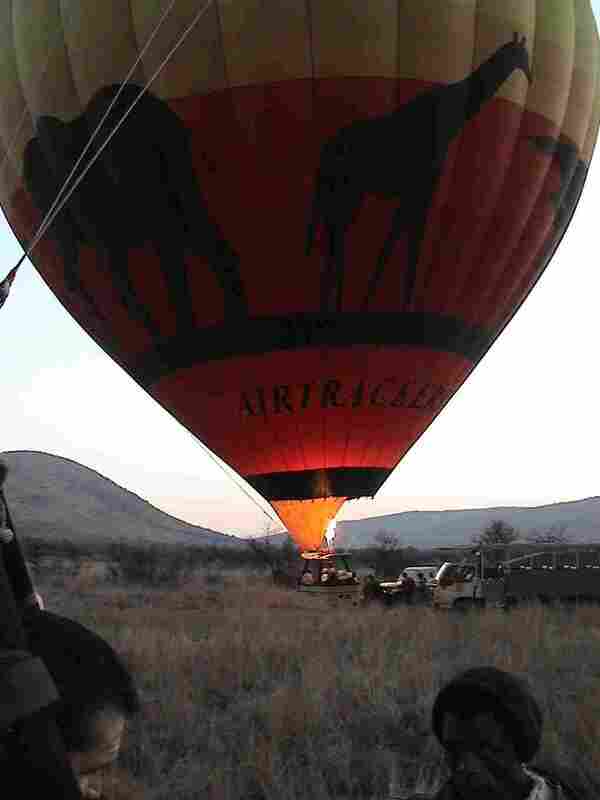 The ride into Pilanesberg National Park to the balloon site is long -- maybe a half hour -- and very cold. (I'm glad I brought along my long johns to wear!) I'm surprised there are some animal sightings along the way, most impressive of which was two cheetah brothers walking along the road. We stop to stare at them and take pictures. 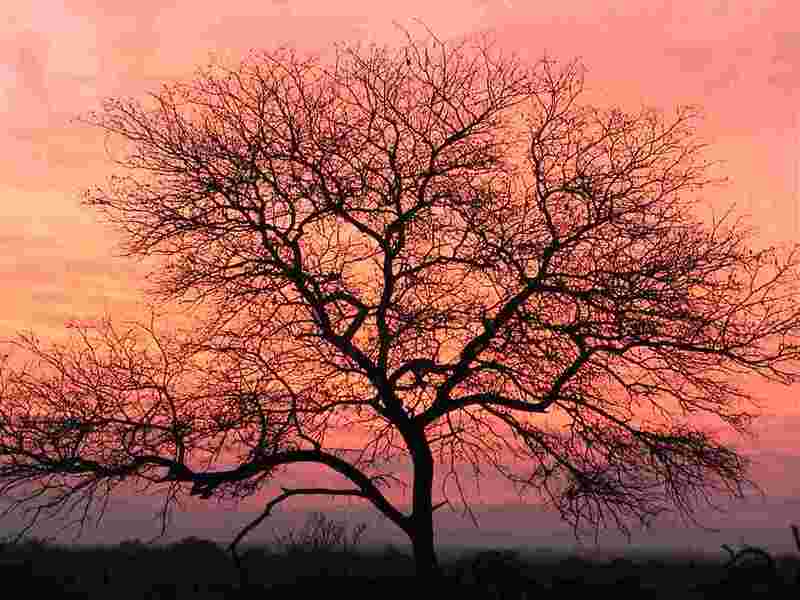 The night's darkness slowly yields to the first signs of morning light: pastel pinks and orange and a touch of red. When we reach the balloon-launch site, two balloons are nearly inflated. Eight passengers and one pilot climb into each basket. Our balloon is a little slower to take to the air than the other. The support team members let go of the lines and we slowly, very slowly, rise. The baskets are divided into five sections: four with two passengers each and a larger center section for the pilot and several bottles of gas. We're told the other balloon is the second largest in Africa, and ours is only slightly smaller. Both have four burners. We glide ever so easily a foot or two feet above the ground. The other basket is maybe 100 feet high. It's so quiet and peaceful, except for occasional burner blasts. The breeze at ground level is nil, so our pilot, Jay, heats up the air and we rise. We see animals here and there -- impala, wart hogs, brown hyena, tsessebe, and others -- and then we spot a rhinoceros, a very rare, black rhinoceros. And we see six white rhino. I'm taking video and stills like crazy. In my enthusiasm, I rotate the camera for a vertical-orientation snap shot, and then hit the video button by mistake. You'll have to lie down to make sense of that video. Then we see lions. Lots of lions. Maybe a dozen, moving away from us. Several seem spooked by the burner blast. We watch as the chase vehicles move along the road. Jay speaks to them and the other pilot by radio. All too quickly, an hour has passed and it's time to find a landing spot. The other balloon, slowly descends and sets down a short distance from a road. We watch from an elevation of maybe 50 feet. Stalled, our balloon remains aloft until it finally drifts close to the same road. Gradually, easily, seemingly effortlessly, Jay lowers our craft. He instructs us to face away from our direction of travel and to crouch down in our little compartments. As I do so, I notice one of two foot holes in the side of the basket. They're used to climb in (and out), but one is just perfect for me to take video of the landing. We land with a gentle bump, and the balloon crew is right there to hold on so we don't bounce or inadvertently take off again. The top canopy of the balloon is lifted and the hot air gradually escapes. The landing is complete. The whole flight, from beginning to end, was spectacular. The pilot said it was unusually good. All the passengers are raving. A bottle of champagne is opened and glasses are filled. We are told this tradition is customary whenever a balloon's occupants survive a flight. We get back in our 12-passenger "truck" and drive out of the park. But the "trip" isn't over yet. We continue on to Bakubung Bush Lodge for breakfast. And a delicious breakfast it is! What a super adventure! 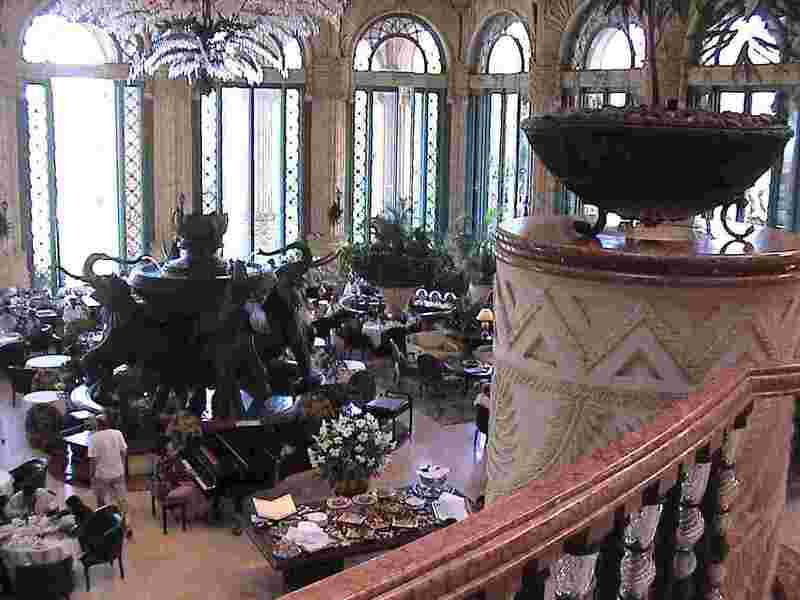 Back at the Palace, we decide to go on a picture-taking expedition -- inside and outside of the resort -- and we consume most of the afternoon in the process. A bite to eat and a short nap (for JJ), and all of a sudden the sun is going down. Based on a tip we heard from one of the workmen during our "photo tour," we get ready for a seven o'clock fireworks display. JJ has a vodka and tonic in hand. I have my camera. The display begins at 7:05. I snap stills, but my digital camera appears unable to capture the color. JJ is taking photos left and right. The performance is fairly brief -- maybe ten minutes -- but rather impressive, and a fitting grand finale to spectacular day. We leave the Palace to look for a suitable supper, but find none, so we skip the meal. When we get back, room service has attended to our room. On each bed is a fresh terrycloth robe, folded carefully with the "belt" curled in a circle. A sweet is on each pillow. A pair of terrycloth slippers is neatly placed on a white towel by the side of each bed. And sprinkled over the entire bed are flower pedals. Is this lavish, or what? When I push the plunger on my travel alarm, the face lights up and tells me it's exactly seven a.m. We begin our last day in Africa. We have breakfast in the Crystal Court. I go wild: omelet (cheese, mushroom, artichokes, garlic, spinach), prosciutto ham, four or five cheeses, roast beef (three servings! ), a poached egg, three kinds of fruit juice, a spiced pear, pastry, a tomato stuffed with mushroom, potatoes, and more! Everything is delicious. And the Crystal Court itself is breathtaking to see. After we eat, we just sit at our table and enjoy the luxury. It's another perfect day: bright sun, cool breeze, nearly-cloudless sky. This is ending our Africa adventure on a high note. We pack our bags and check out of the Palace. There's still about three hours before we're due to be picked up for the drive back to Johannesburg. We walk leisurely around the grounds and take some more pictures. Then we stop by the pool (one of the pools) for a drink (tonic water for me, bitter lemon for JJ). About forty minutes before our car is expected to pick us up, we check in at the concierge desk and find the car has already arrived! The driver routes us back via Pretoria. It's interesting to see the sights along the way. There's not as much time waiting at the airport as I thought there'd be, but enough time to do a little shopping, change clothes at the Premier Club (how nice to have a complimentary pass to enjoy the club's comforts), and catch our flight. It's a long flight back to Atlanta. Sleeping in the cramped Airbus seats is a challenge. In Atlanta, we're once again in familiar surroundings, but our Africa adventure has changed us forever. The sights excited and entertained us, the animal encounters thrilled us, the food and accommodations delighted us. The memories will long endure. Our flight took us out of Africa, but I don't think anything will take Africa out of us. Animals seen: blue wildebeest, tsessebs, common duiker, klipspringer, steenbok, impala, cape buffalo, kudu, nyala, bushbuck, waterbuck, wild dog, black-backed jackal, chacma baboon, vervet monkey, elephant, burchell's zebra, cheetah, leopard, lion, giraffe, hippopotamus, spotted hyaena, brown hyaena, porcupine, scrub hare, lesser bushbaby, white rhinoceros, black rhinoceros, tree squirrel, warthog, ganet, and lots of birds and other creatures. Upon our return, I learn my friends in Punta Gorda are indeed safe and unharmed, but Hurricane Charlie (which hit on Friday, the 13th) inflicted significant damage to their home, pool, and sailboat. Though their community was ravaged, they seem in pretty good spirits, and they report rescue and aid efforts were quick and effective. The road back to "normalcy" is likely to be a long one, however. A week or so after getting back home, JJ sees a dentist about his detached crown and there's good news: it's possible to cement the crown back where it belongs, at relatively little cost! My cold pays a return visit, probably because I was so cautious using Ester C during the trip (the "C-ration" I had with me was limited). At home, however, I'm able to administer liberal doses, so the visit is a short one.